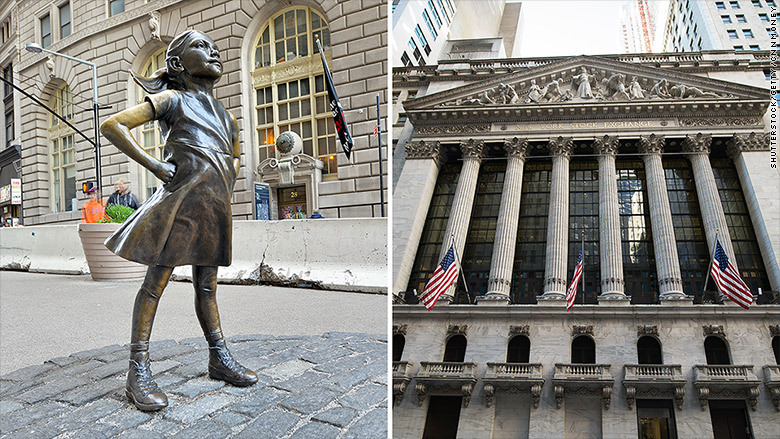 "Fearless Girl" is getting a new home at the New York Stock Exchange. The popular statue will be moved from the spot where it was installed last year, opposite the "Charging Bull" sculpture in Lower Manhattan. "Fearless Girl" will move about three blocks away, outside the stock exchange and facing the building. New York Mayor Bill de Blasio and State Street Global Advisors, the financial firm that installed the statue in March 2017, made the announcement on Thursday. They said the statue would move to its "long-term" home by the end of this year. The decision was first reported by the New York Daily News. The mayor's office said the city is also considering moving "Charging Bull," though it did not say when or where. The bronze statue has captured the hearts of New Yorkers and tourists. At first, she was only supposed to stay in place for a few days. But the city decided to extend her permit for a year in response to the public's embrace. Fans have dressed her for poor weather and imitated her pose — hands on hips, chin held high — to be photographed by her side. Crowding around the statue posed a safety risk and was a factor in the move, the city said. Thomas Farley, president of the New York Stock Exchange, called the statue "a striking symbol of our ongoing journey toward greater equality." "We eagerly await the arrival of Fearless Girl to her fitting new home," he added. The "Fearless Girl" statue is moving to face the New York Stock Exchange. De Blasio called the statue "a powerful symbol of the need for change at the highest levels of corporate America." He added that "she will become a durable part of our city's civic life." "Fearless Girl" was designed to call attention to a State Street Global Advisors initiative to increase the number of women on corporate boards. The company said more than 150 companies have added a woman to their boards since "Fearless Girl" was installed. "Our hope is that by moving closer to the NYSE she will inspire more companies to take action," said Cyrus Taraporevala, State Street Global Advisors president and CEO. Lori Heinel, deputy global chief investment officer for State Street Global Advisors, told CNN's Maggie Lake on Thursday that her company has been working with the city for a year to find a more permanent home for the statue. "We think it's perfect that she's going to stay ... at the heart of that financial district," Heinel added. That way, the statue can serve as a "constant reminder of the work that public companies still have to do" to increase gender diversity on their boards. Kristen Visbal, the sculptor, told CNNMoney she is "thrilled" that the statue will remain in New York City. She added that she finds the new location "exciting," but that she believes the statue's message has extended beyond finance. 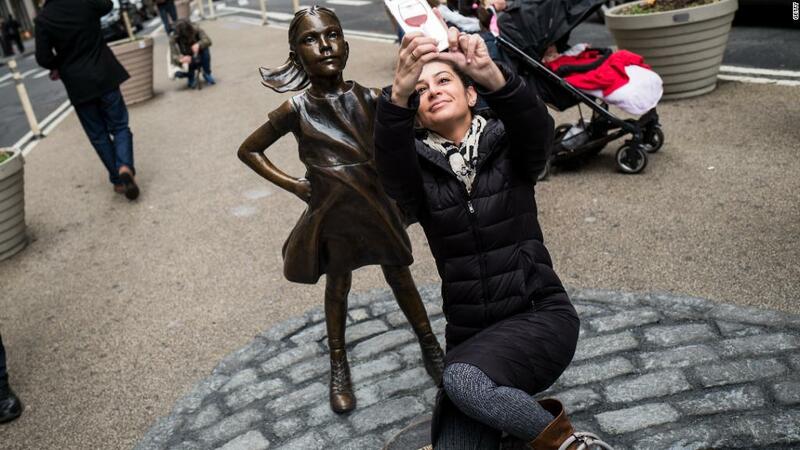 She hopes that by remaining in the public eye, "Fearless Girl" will "continue to inspire the global community regarding gender collaboration in every aspect of life." A woman poses with "Fearless Girl." "Fearless Girl" also has her critics, including Arturo Di Modica, the sculptor who made "Charging Bull" and surreptitiously placed it in front of the stock exchange in 1989. Police removed the statue, which didn't have a permit. But public support was so great that the city gave it a permanent home nearby. It has stood ever since as a symbol of American capitalism. At a press conference last year, Di Modica told reporters that "Fearless Girl" tarnished the positive message of the bull, which is "a better America and a better world." He could not immediately be reached to comment on the possibility that "Charging Bull" may move. Others were troubled by the origins of "Fearless Girl," arguing that the statue's feminist message was little more than an attempt by State Street Global Advisors to cover up a spotty record on pay equity. Months after "Fearless Girl" was installed, State Street agreed to pay $5 million to settle allegations that it underpaid female and black employees. The firm denied wrongdoing.